Late Khurshid Kamal Aziz was indeed a forward looking historian and perhaps the best Pakistan has produced in terms of academic honesty, quality of scholarship and analytical skills; and for a lay-reader this is vintage K.K. Aziz. From the point of view of the new Pak-Studies generation of Pakistan, this can be categorized as one of the single most essential text; one that single-handedly captures the historical, sociological (including religious), political, psychological and philosophical dimension of the genesis of a new nation that is still struggling to evolve.But a word of caution that this is meant to be a casual all-encompassing essay and not for those who are only impressed by tomes when it comes to such multifarious dimensions. There are no hypotheses that are furnished and tested here; rather, I would call it a lucid effort to supply some fundamental historical narratives (in the context of Muslim Nationalism in pre-partition India) and put them in perspective. In my view, this text has enough potential to strike some middle grounds between misplaced nationalism muddled by religious biases, Orwellian methods of Zia regime and pseudo-intellectualism of likes of Nasim Hijazi and Orya Maqbool Jan etc which is popularly sold in the name of 'history'. The Making of Pakistan (A study in Nationalism) is a profound survey of the prolific writer. He delineates in a comprehensive way the inevitable historical factors that helped shape the Muslim nationalism after multifarious events. The writer also brings to the spotlight all the other benignant causes, like the political rift between the Hindu and Muslim community that made the Muslims of subcontinent feel a dire need of a separate representative party. On the other hand, the religious and cultural clashes that led to the realisation of their centuries old facade of reconciliation so eventually they started reverting back to their religious heroes. The Muslims and the Hindus drew a stark contrast in their language, education, literature, philosophy and art. These were the forces that ruled the minds of their communities from then onwards. Pan Islamism is another factor that mould the thinking pattern of the adherents of nationalism. How the psychological outlook of he Muslims too gave strength and solidarity to the cause is of utmost importance and in this process, mythology & symbolism and fear & insecurity played their part at best. Interestingly enough the writer has given consideration to the formation of Indian Nationalism as well as Muslims nationalism. If Indepth analysis of this historical tussle is carried out, it will be obvious that as long as it is true that the Muslims struggled hard to distinguish themselves (which they were), the Hindus staunchness helped them unconsciously to reach their ultimate and desired destination. The writer's unique and matchless approach to this point is worth perusing where he proves his historical stance by penetrating deeper in ancient history. 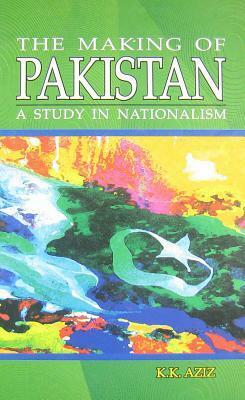 An excellent book on Pakistan's Ideology and Pakistan Movement. A must read for someone interested in Pakistan movement and its leaders. i read for critical analysis. K.K. Aziz - Khursheed Kamal Aziz, better known as K. K. Aziz was born in December 1927, in village Ballamabad near Faisalabad. He was educated at the M. B. High School Batala, Forman Christian College and the Government College, Lahore, and the Victoria University of Manchester. He has been on the academic staff of the Government College, Lahore, and of the Universities of the Punjab, London, Cambridge, Khartoum and Heidelberg, and has delivered occasional lectures at the Universities of Karachi, Peshawar, Dacca, Islamabad, Hull, Newcastle-upon-Tyne, Geneva, Oxford and Bergen.During intervals snatched from teaching abroad he has served at home as Deputy Official Historian to the Government of Pakistan, Chairman of the National Commission on Historical and Cultural Research, and Special Policy Adviser to the Prime Minister (Z. A. Bhutto). Author of over a dozen books, he is a historian of rank with an international reputation.